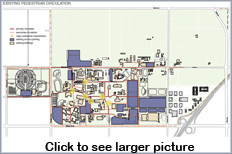 Circulation within the campus includes pedestrian and bicycle activity. To facilitate convenient and efficient pedestrian and bicycle circulation, campus activity centers were identified and quantified. The probable locations and orientation of new facilities were identified as destinations in a demand analysis. From this analysis a series of routes was suggested. Most are existing routes which require enhancement. 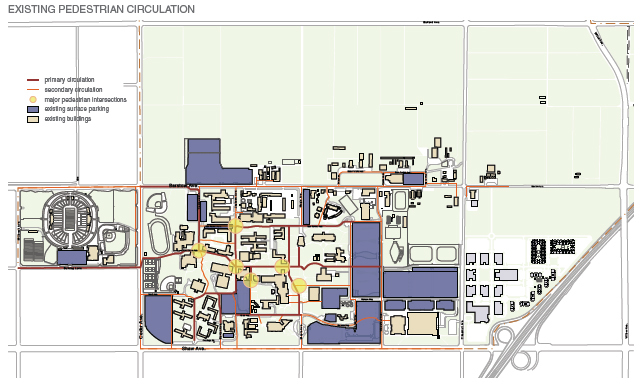 Some are new corridors designed to integrate the entire campus from Bulldog Stadium on the west to Campus Point and Save Mart Events Center on the east, reducing or eliminating the need to cross the campus other than on foot, by shuttle, or by bicycle. In the past, bicycle access to the campus and circulation within it was widespread. Some streets have cycle lanes, but large volumes of fast moving traffic discourage many who would choose to bicycle to campus. On the campus, bicycle routes are often undifferentiated from footpaths, so conflicts with pedestrians are inevitable. 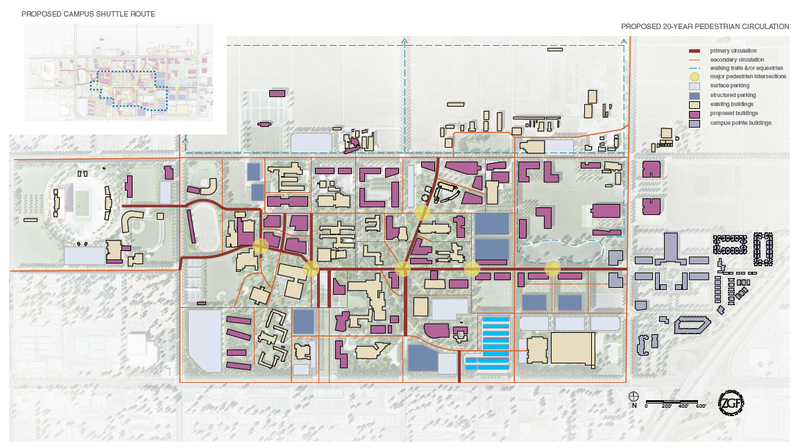 Separate routing for most large service vehicles will make pedestrian circulation safer, and greater conformance of building orientation with the overall form of the campus will make direction-finding easier. Attention to shading and lighting along footpaths, and compatible landscape improvements will make walking feel safer and more rewarding than it is now. Some new footpaths will be added to the network to improve convenience, and greater clarity in way-finding will make campus destinations easier to find. Way-finding will extend beyond the campus to surrounding streets, including jogging trails that follow windrows around the farm. Circulation will be assisted, especially for those who have difficulty walking by continuously circulating shuttle vehicles on a fixed route. Bicycle riders and pedestrians will each seek the most direct route between destinations, so conflicts between them on campus pathways are inevitable. However, in congested areas of the campus, demarcation of a bicycle route can reduce conflicts, and can direct riders clear of places with limited sight lines. In some cases, the location of bike racks and other facilities can make a designated route more attractive to riders.